Yuca root needs to be prepared before starting. If your root is not ready to cook yet, take a look at the step by step instructions in the yuca root section of the Food Market. 2) Remove yuca root from boiling water, and dump out the hot water into the sink. Fill the same pot with cold water and place the yuca in the cold water. Place this pot on the counter top. This will cool off the yuca, stopping the cooking process and make them easier to handle. 3) Place a deep dish frying pan on the burner where the boiling water was and star to heat up the oil. The burner should be at medium-high to high temperature. With our electric burner, the maximum worked best. 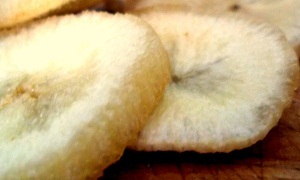 4) Slice the yuca into uniform chips of desired thickness. Try not to make the chips too thick, I recommend 1/8 in (2-3mm). The thinner, the crispier! 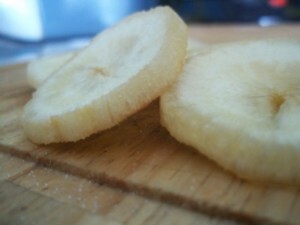 5) Place the yuca chips in the hot oil and fry until golden. This can take 2-8 minutes depending on the thickness of the chips and the temperature of the oil. Do not over crowd the oil with yuca chips. Putting too many chips in at a time will lower the temperature of the oil and prevent proper cooking. Multiple batches is the best method. 6) Once golden, remove the chips with the spatula. Enjoy! Please leave comments on this recipe! Let me know if you have any suggestions or a story about preparing this meal while traveling or back at home with friends!